MICHIGAN CITY — When it comes to restoring, repairing and refinishing furniture, customers can rest assured they are getting “the works” at Furniture Werks, 4980 W. U.S. Hwy. 20. As far back as 1939, the Butcher family has been providing quality and dependable services for customers throughout Indiana, Illinois and Michigan. Furniture Werks Owner/Manager Lou Butcher explained how his father, also named Lou Butcher, fell into the business in 1939 and kept busy throughout the years with his Butcher Furniture Service located on Chicago’s south side. “In the 50s and 60s, people bought furniture, at an average price, that was significantly made better than furniture today. People expected to refinish and reupholster their purchases,” Butcher explained. While in high school, Butcher learned about the business first-hand as he worked for his father. “When I got my driver’s license, I was a gopher and a delivery person,” he remembered. Wanting to experience life farther away from his Chicago home, Butcher attended Tarkio College, a small liberal arts school in Tarkio, Missouri. Majoring in English and minoring in business, he spent five years substitute teaching and teaching English and shop. Butcher also sold insurance, and worked in factory management, even employed at Kingsly Furniture Company, a furniture manufacturer in La Porte for a time. While a teacher, he supplemented his income by spending more time in the family business. In the 1970s, Butcher decided to return to what he knew best and try his own hand at the family furniture business. He sent a letter to all of his father’s former customers, as his father had closed his business by then, and placed a small ad. “Dad was a pack rat. He kept a lot. I still have a lot of his tools,” he commented. Butcher opened his shop in 1977 in a small building on Plum Street. After two expansions in this building, he then moved in 1988 to the front of the building occupied (then and now) by DeVrie Tire Company on Michigan Blvd. 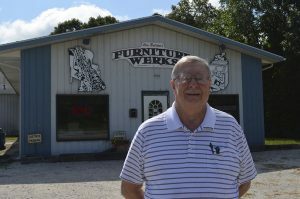 Ten years later, Furniture Werks moved to its current location, increasing the shop’s square footage from 4,000 to 7,000. “I really like the location. At my two previous locations, I would always have to give the customers directions. The exposure and walk-in traffic is significantly better now,” Butcher shared, adding that he’s gained business from travelers to Lighthouse Place Premium Outlets, Blue Chip Casino and the beach area. Butcher recalled the early days of his business when he would walk through the furniture showrooms of Chicago’s Merchandise Mart. Butcher’s dedication to a high level of customer service, attention to detail and quality of work was as evident in the early days of his business as it is today. In the mid 1980s, Butcher noticed an ad in The News-Dispatch for a two-year master’s in business administration program at Notre Dame University. He applied and was accepted, graduating with his MBA in 1988. Noting the number of students from large corporations in his classes, Butcher deduced that the administration must have been also searching for a “different flavor and perspective” from a small business owner like himself. Today, Furniture Werks draws customers from the Chicagoland Area, Northwest Indiana and Michigan. The shop offers a full range of furniture services including furniture repair and refinishing, family and heirloom furniture repair and restoration, antique furniture restoration, commercial services, and custom furniture repair and refinishing. “It’s very gratifying to have customers come back who have inherited furniture 30-40 years ago that I did work on and they say, ‘Let’s do this again,’” Butcher said. In his many years of business Butcher has seen many industry changes. In the last five or ten years he’s seen an increase in customer’s bringing in their chair and sofa cushions to be re-filled. “They wear out their foam or they need something firmer because when they sit down they can’t get up,” Butcher said. Butcher said he uses a catalyzed lacquer finish for carefree durable wood protection without a plastic look. Customers are also welcome to borrow a treated wood table leaf piece and test its durability at home. “People are buying expensive outdoor furniture and they need new slings, straps and new support systems,” he also noted about today’s customer. In their showroom, Furniture Werks offers over 15,000 fabric selections from Greenhouse and Merchandise Mart designers Robert Allen, Kravet and Duralee. Sometimes customers will ask what the current fabric trends are, but for the most part “my customers aren’t interested because when you do something like this it lasts longer than the trend,” Butcher explained. Furniture Werks regularly participates as an exhibitor in the Porter County Fair, Porter County Home & Lifestyle Show at the Porter County Expo Center and the Builders Association Home & Lifestyle Expo at Blue Chip Casino. Over the years, Butcher has been involved with the Michigan City Lions Club, Michigan City High School Athletic Booster Club and Orak Shriners Motor Patrol. An active member and previous deacon of the First Presbyterian Church, he helped begin the Samaritan Counseling Center. He previously held a board position on the American Society of Interior Designers. Butcher is currently on the board of directors for the small community of Shoreland Beach, where he resides. He and his wife, Jan, a retired nurse, have been married 41 years; they have seven children, 15 grandchildren and one great-grandchild. Their grandson, Matt Brown, has been working with his grandfather at Furniture Werks the past two years; he is one of four employees in addition to Butcher. For more information on Furniture Werks go to www.furniturewerks.com or look up “Furniture Werks” on Facebook. Hours of operation for Furniture Werks are: 8:30 a.m. to 5 p.m. Monday through Thursday and 8:30 a.m. to 4 p.m. on Friday. The shop may be reached at (219) 872-1700 or Toll Free: (800) 367-5676. A dozen swatches had been preselected for us, all with various shades of blue and white, including a velvety Kravet fabric with figure eights, soft and thick; a blue and green pattern with geometric shapes in a shiny cotton; two heavy fabrics, also by Kravet; and a rich blue with a shimmering glow by Duralee that comes in two patterns; studded with gold bumblebees or simple but elegant dragonflies. It would take less than six yards of the material, and once chosen, it was delivered in 48 hours. As Beene Veen started to tear away the old covering and foam from the couch, it appeared to have sustained less damage than the exterior and protected the frame successfully. The springs (made by hand of iron, probably sometime around 1870) were in excellent shape, as was the oak, now that we could see the natural color. The metal on the frame needed cleaning but was otherwise in excellent shape. Even the web of string, which holds the metal pieces in place while the work is done, was in good shape. It is possible, however, that the daybed had been renovated. Beene says he has seen furniture built in the 1930’s that has been redone as many as four times. Calvin cleans the frame by brushing on a solvent, then uses a stiff brush to work the loosened soil off, following up with a second solvent and clean rags. Repairs to the structure, the skeleton of the couch, take an unpredictable amount of time because of the variation, joints need to be reinforced with glue; crevices need to be filled where the fixative has deteriorated. In this case Art Rodriguez is measuring, cutting, gluing and pressuring the wood frame, rebuilding it to last. Using a spray gun, Beene clears the oak frame of varnish and dirt by moving back and forth across the frame at 18 to 24-inch intervals. Much of the surface material has worn off over the years. Both Beene and Lou believe this piece is about 100 years old. There is so little interior damage that it has probably been cared for most of the time. The next step is the choice of wood color. Basically there are four choices for this; a light beachwood finish, a medium, warm cherry tone; mahogany, which is highly unlikely for this piece with our fabric; and a simple, light coating that brings out the natural color of the oak, while protecting and finishing the wood. Lou grabs an unmarked plastic bottle, the kind used for hair color, and we do a test piece to see what it will look like in it’s natural state. The answer is obvious; we go with it. Now the new permanent webbing is created using and 8-knot ring spiral fitted to the frame. Beene uses a button dye-cutter to cut the material that will cover the 28 buttons. The basic layer of cushioning and interior fabric, a strong burlap is cut and pieced together and secured with a nail gun, staples and glue. The function of these basic components has not changed in years, but the inherent flexibility and stability will lengthen the life of the piece. This is the moment for celebrating the craftsmanship of this project and the simple beauty in the color and texture of a piece of cloth. Decisions are made about the square dragonfly motif, which is repeated every 14 inches, and the fabric is cut to fit; the dragonflies must fly in formation. The darts and pleats are sewn directly into the wells of the springs and onto the couch by hand. Creating the exterior cover takes about 8 to 10 hours, but that’s with a professional who has been working with upholstery for 17 years. This is as much like playing a piano as textile work gets, with the furniture maker moving at a certain rate of distance over the surface like he has 100 times before, and his hands know the process. The couch is stuffed today. 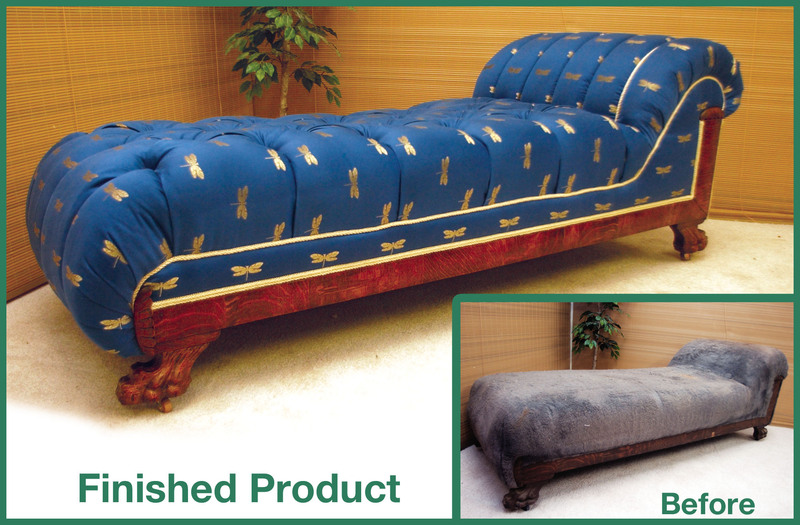 Foam is cut and pushed into the wide tufts that crisscross the body of the couch, and fat and swelling rounded channels are created for the head portion of the daybed. The entire couch is fastened with an air stapler, reinforced over and over again. The pattern of folds, pleats and darts matches perfectly. The trim is from Rogers Custom Trim in Chicago. Lou remembers it, thought it would match perfectly, and it does. The gold double welt trim is measured, cut and finished on the sewing machine. The metal frame that will hold it in place is fixed onto the edges of the couch, and then the braid is wedged into the frame with the back of a tack puller and pounded with a plastic hammer to secure. The makeover took less than the 10 days Lou Butcher estimated at the beginning of our rehabilitation.